The SPX FLOW Inc. Industrial and Energy (I&E) division signed at ACHEMA a huge distribution agreement with Tapflo Group for Central and Eastern Europe including Austria and South Africa. 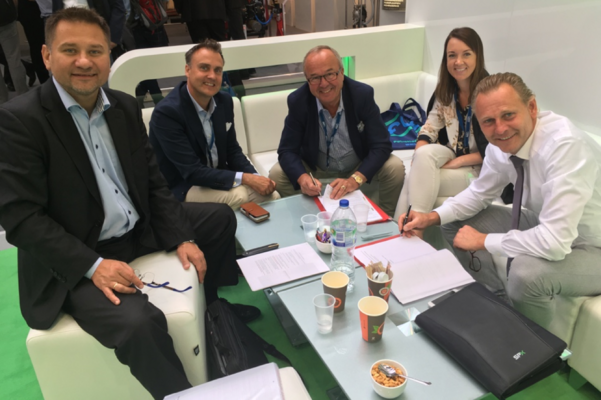 The main exhibition for the process industry that took place in Frankfurt in June was the ideal venue for the signing of the agreement that started with immediate effect and covers the Johnson Pump®, Bran+Luebbe®, Plenty®, Lightnin®, Airpel® and GD Engineering® brands. Upon signing Tapflo placed an initial stock order for 200 Johnson pumps.